Prayer of the Day: Eternal God, your kingdom has broken into our troubled world through the life, death, and resurrection of your Son. Help us to hear your word and obey it, and bring your saving love to fruition in our lives, through Jesus Christ, our Savior and Lord, who lives and reigns with you and the Holy Spirit, one God, now and forever. Young lives tragically and undeservedly cut short. A life mercifully and undeservedly spared. This Sunday’s gospel places these very different outcomes in stark contrast. The story about the eighteen people killed in the collapse of a tower and the Galileans killed in the very act of worship both have a contemporary ring to them. This week an Ethiopian passenger jet plunged to earth killing all on board. Then we got the news of the forty-nine men, women and children shot to death while worshiping in their mosques. Why these people? Why now? It is not clear why Pilate killed the Galileans in our reading. It is possible they were involved in an insurrection of some sort, but they could also have been innocent victims selected for slaughter at random “to send a message” to any would be insurrectionists. Maybe, like so many killed in Syria and Sudan these days, they were simply caught in the crossfire of someone else’s fight. Violence against innocent civilians is distressingly common place in our world. Blaming the victims of misfortune comes naturally. We take a perverse comfort in believing that victims of accidents and violence were somehow at fault for what befell them. “He should have known better than to hike that trail this time of year.” “She shouldn’t have gone to that party dressed so provocatively.” “They should never have traveled to a dangerous country like that.” After all, if I can identify some error, moral infraction or misjudgment on the part of the victims, it is easier for me to convince myself that I can avoid their fate. I just have to exercise more care than they did or refrain from the careless and irresponsible behavior I believe led to their cruel end. I can fool myself into thinking that I am in control of my life and safe from the randomness with which death and destruction so often strike. Unlike the seemingly hapless victims in the daily news-both in Jesus’ day and our own-the fig tree has earned the judgment of destruction passed by the owner of the vineyard. In a semi-arid climate where cultivatable land is limited, it is difficult to justify allowing an unproductive tree to go on using up valuable soil. Yet unexpected and cruel as was the fate of the victims we read about earlier, equally unexpected and undeserved is the vinedresser’s plea for mercy sparing the fig tree. It is tempting to interpret this parable allegorically with God being the owner of the vineyard and Jesus the vinedresser interceding on our behalf for mercy. But that does not work for a number of reasons. God clearly does not wish for the destruction of anyone. Even when God threatens judgment, it is with the hope that those who are so threatened will turn and repent. The owner of the vineyard is not making a threat. He has made up his mind to have the tree down. He seems to have no hope for the tree. There is no righteous indignation here. This is simply a business decision. The tree is an investment that has failed for three years to yield a return. It is time to pull the plug and invest elsewhere. The vinedresser’s motives are unclear. Perhaps he sees more potential in the tree than does the owner. In any event, the vinedresser is convinced he can get fruit out of the tree and tries to convince the owner to give him one more year. 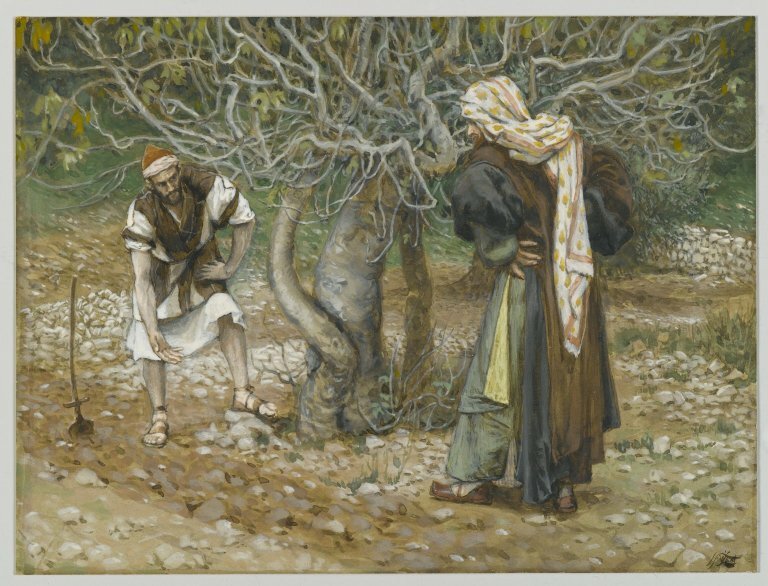 At this point, the parable of the fig tree comes to an abrupt end leaving a lot of loose ends for us to consider. We would like to think that the owner said, “Fine. You think you can make this tree produce some figs? You have one more year. Knock yourself out.” But Jesus does not tell us so much. It is just as likely that the owner said, “You have to be kidding! For three years this tree has produced nothing. What do you think will be different about year four? Cut it down!” The parable therefor leaves us in a tenuous place. We can only conclude that we have but the present moment. Today we are alive. There is no guaranty beyond that. Yet we are to understand that the present minute is nonetheless a precious gift. We dare not allow it to languish under the illusion that there will always be more time. The tragedy of the lives lost under the fallen tower, under Pilate’s sword, in the crash of the Ethiopian jetliner and in the New Zealand mosque shootings is not merely that they were prematurely taken. The greater tragedy is our tendency to construe them as somehow the fault of the victims, something that happens to somebody else rather than recognizing in them a sobering reminder of our connection to all humanity in our frailty and vulnerability, God’s undeserved gift to us of yet another day and a call for us to use that day responding to these tragedies with the same compassion God so richly, lavishly and undeservedly pours out upon us. Given that, undeservedly and inexplicably, we have been freely given this day, this hour, this minute-what are we going to do about it? It is tempting to begin promising to fill up our remaining days with good intentions. I will buy only Free Trade coffee; I will increase my giving to the church and to the poor; I will be more “intentional” (whatever that means) in working for justice and equality. All of those objectives are noble, but they amount to little more than New Year’s resolutions for a year we might not actually have. True discipleship begins with being rather than doing. Only a good tree is capable of bearing good fruit. Thus, before we can begin to do anything fruitful, we must be the kind of tree Jesus is looking for. We must be creatures capable of living joyfully, thankfully and obediently within the limits of our human mortality. Disciples of Jesus are called to embrace with thanksgiving life in all of its immediacy and contingency. They are challenged to receive each day as one that the Lord has made and offers as a gift. They are mindful that the number of such days is finite, that tomorrow is not a foregone conclusion and that health, strength and length of days is guaranteed to no one. But that only makes today with all of its potential and possibilities the more precious. It is out of such faithful gratitude that generosity flows. Generosity gives birth to compassion and compassion fuels zeal for justice, righteousness and reconciliation. Here is a poem by New Hampshire poet laureate, Jane Kenyon, a woman whose struggle with depression and chronic illness taught her the art of living thankfully, generously and compassionately.